Last July, a young Egyptian Shia-Muslim man, Mohamed Asfour, was sentenced to three years in jail for "insulting the Prophet Mohamed's companions," who are revered by Sunni Muslims. It was the first time in Egyptian history that a Shia Muslim was incarcerated on this charge. Asfour, who was originally a Salafist teacher in the Nile Delta city of Tanta, maintained that his arrest came after a month-long campaign of abuse by village residents following his conversion to Shia Islam. His own parents-in-law reportedly forced his wife to divorce him over his change in faith. "Few media outlets reported the incident," says well-known Egyptian Shia activist Ahmed Rassam El-Nafis. El-Nafis added that although Asfour's prison sentence was commuted from three years to one year, the case did not get the national attention it deserved. Asfour's story, El-Nafis tells Ahram Online, is an example of a crackdown on religious minority groups, particularly Shias, in post-revolution Egypt. "Egyptian media publish false stories about Shias, depicting them as the bad guys who are working for Iran to spread Shia Islam; no one cares about the troubles these Egyptians suffer or even their right to citizenship," the activist adds. This is despite the fact, El-Nafis points out, that for two centuries (969 -1171) Egypt was a Shia nation. Egypt's Al-Azhar, now the highest seat of Sunni religious authority, was originally a Shia place of worship, founded in 970 in order to spread Shia Islam throughout the world. "The Mubarak regime targeted Egyptian Shias as a way to garner support from the [anti-Shia] Gulf kingdoms, depicting Egypt as opponents of Shias and Iran," says Shia activist Mohamed El-Derini. "The current Muslim Brotherhood regime believes that fighting Shias is a way to come closer to God; this is extremely dangerous." El-Derini was arrested, detained and tortured by Mubarak's (now-defunct) State Security Apparatus several times, despite frequently having no official charges levelled against him. In a 2005 statement, the Cairo-based Egyptian Initiative for Personal Rights pointed to "his belonging to the Shia Muslim faith" as the reason why he remained in administrative detention for 15 months. The activist, currently the head of Egyptian Shia organisation 'Congregation of Ahl Al-Bayt' ('the family of Prophet Mohamed'), subsequently wrote about his experiences of torture at the hands of state security officials in 'Hell's Capital,' a book that led to his re-arrest. The situation has not changed since Mubarak's ouster, say Egyptian Shias, with many documented cases of attacks and arrests. In December 2011, the Egyptian Shia community made headlines when a group of them publicly celebrated Ashura, a Shia festival commemorating the martyrdom of Prophet Mohamed's grandson, Imam Al-Hussein, at Old Cairo's Al-Hussein Mosque. Clashes erupted between local Salafist groups and the attending Shias, which ended with the arrest of dozens of the latter and the mosque's closure. In May of last year, ultra-conservative Sunni-Muslim groups attempted to destroy what they saw as a Husseiniya (a hall prepared to mark Iman El-Hussein's martyrdom), allegedly built by Tanta lawyer and Shia activist Emad Qandil. All the Shia activists to whom Ahram Online spoke denied the existence of any Husseiniya halls in Egypt. This is despite reports last year by several Egyptian and Arab media outlets that a number of such halls had been erected across the country – especially in Cairo's 6 October City, which is home to a sizeable Iraqi Shia community. El-Nafis, who used to be a member of Egypt's Muslim Brotherhood before converting to Shia Islam in the 1980s, claims he survived an assassination attempt last year, on account of his being a Shia. Along with facing arrest and condemnation by local communities, Shia activists told Ahram Online about the "glass ceiling" that Shia communities are increasingly subject to. "We're under a sort of economic siege, as many of us are forced to leave our jobs when it becomes known that we are Shias," says Shia human rights activist Bahaa Anwar, head of the Fatimid Human Rights Centre, which works to support ethnic and religious minorities in Egypt. "You have professors in universities who are not promoted as they should be because they are Shias; you have university graduates who can't find decent jobs because of their faith," Anwar asserts. For decades, international organisations – including the UN, Human Rights Watch and Amnesty International – have documented instances in which Egyptian Shias have been targeted for their religious beliefs. A December 2012 report by UN refugee agency UNHCR highlighted the fact that Shias still cannot openly practice their religious rituals in Egypt. Meanwhile, the US Commission on International Religious Freedom continues to label Egypt as a "country of particular concern" in terms of systematic violations of religious freedom. 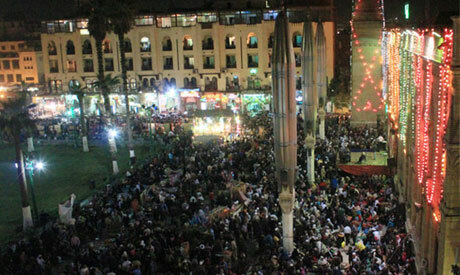 Egypt's Shia community, however, rejects the notion of international intervention. "We are totally against the use of foreign pressure to win our rights. This is why I rejected calls from prominent political activist Saad El-Din Ibrahim to speak abroad about the rights of Egyptian Shias," Derini says. The fear, the activists explained to Ahram Online, is that a foreign country championing the cause of Egyptian Shias would only confirm one of the most common accusations levelled against Shias in Egypt: that they are agents of Iran. Meanwhile, anti-Shia sentiment continues to be disseminated via the internet and the media in Egypt. Just last week, Mohamed Ismail Makdam, founder of the ultra-orthodox Salafist Call, slammed the Muslim Brotherhood for "allowing Shiism in Egypt." "Future generations will not forgive us if Shiism is spread in Egypt. They will curse us if we did not fight it," the influential sheikh said in an online video. In a televised interview last week, well-known Salafist preacher Sheikh Safwat Hegazy blasted a recent government decision to allow Iranian tourists into Egypt, claiming that the visitors would attempt to spread their beliefs in Egypt. "They will lure the poor into converting," Hegazy warned. Taher El-Hashimi, Shia activist and member of international Shia association Ahl-Al Bayt World, told Ahram Online: "Is spreading Shiism already a crime according to Egyptian law? If it is, then spreading Salafism and Wahhabism [ultra-conservative brands of Islam] is also a crime, since Wahhabism is alien to Egypt and originated in Saudi Arabia." El-Derini agrees, adding that he believes that Egypt is paying the price for the ongoing war between Saudi Arabia and Iran, particularly since "the Salafists and religious fascists in Egypt are followers of Saudi Wahhabi doctrines." Egyptian human rights advocates and organisations say there are further problems on the horizon for Egypt's beleaguered Shia community due to the wording of Egypt's new constitution. They say that the national charter does not protect religious minority groups' right to practice their beliefs. The most controversial article, rights advocates say, is Article 219, which deals with Islamic Law. It reads: "The principles of Islamic Law include holistic evidence, foundational rules, rules of jurisprudence, and credible sources accepted in Sunni doctrines and by the larger community." The principles of Islamic Law, which are the backbone of Egyptian legislation according to the constitution, are therefore solely based on Sunni beliefs as approved by Al-Azhar. El-Nafis concludes that, rather than receiving positive discrimination for being a vulnerable minority that is often attacked on the basis of its beliefs, "the constitution only promotes negative discrimination towards Egyptian Shias." Shia activist El-Hashimi takes it one step further, saying that Article 219 "has been specifically tailored to attack Shias and other non-Sunni Muslim sects." Much like the estimates of the size of the Coptic-Christian community in Egypt, the number of Shia Egyptians remains a point of contention: there are no official records. While some Shia activists claim the number exceeds eight million, the Salafists say there are only a few thousand. For their part, activists El-Derini, El-Hashimi and Anwar Bahaa place the number between 800,000 and just under two million. "This figure is increasing, as many people are converting now," El-Hashimi claims. The Shia community believes that ultraconservative Sunni groups downplay their numbers as a form of oppression. "There is no official database at CAPMAS [Egypt's official statistics agency], which is a deliberate attempt to ignore any recognition of Egyptian Shiites," said El-Nafis. There have been a number of recent public initiatives to raise awareness about the Egyptian Shia issue, including the creation of a Facebook Page, "Egyptian Shia," which discusses the rights of Shias and attempts to explain common misconceptions about the denomination. In December 2011, El-Nafis announced plans to found a Shiite party called 'The Tahrir Party.' The party, however, was rejected by parliament's political parties committee on legal grounds. El-Nafis believes this was a deliberate move by the government. "They will come up with any excuse to reject the party," he claimed. "According to the law, El-Nafis is free to found a party that expresses his thoughts like any other Egyptian," says El-Hashimi, adding that Egyptian Shias are in need of a political party to realise their rights. Not all Egyptian Shiites agree, however, that forming a party is the right way forward. "We are searching for common factors and interests in society. This is why I reject religion-based parties altogether," El-Derini says. Some opposition parties, such as the liberal Free Egyptians Party, have spoken out about Shia rights (in particular reference to the wording of the constitution), "but when it comes to Shias, no party is really adopting our cause or helping us," concludes El-Derini. Activist Anwar, who was a member of the liberal Ghad El-Thawra Party until February of this year, says this is because opposition parties are preoccupied with dealing with their own issues and demands. "They need to fight for their cause before they can fight for ours," he says. Anwar resigned from the Ghad El-Thawra Party in objection to party leader Ayman Nour's recent meeting with Iranian President Mahmoud Ahmedinejad. "Ahmedinejad and the Iranian regime are the worst representatives of Shias worldwide," he asserted. The future does not look bright for the Shia community in Egypt. Last May, Al-Azhar Grand Imam Ahmed El-Tayeb chaired a meeting with Islamist forces – including scholars, Muslim Brotherhood members and Salafists – at which they declared their total rejection of "attempts to spread Shiism in Egypt." In February of this year, at a historic meeting between the Iranian president and the Grand Imam of Al-Azhar, the latter demanded that Ahmedinajed refrain from promoting Shiism in Sunni Egypt. There have, however, been cursory attempts to bridge the growing divide between the two main branches of Islam in the form of 'regional dialogue' conferences, recently revived by Al-Azhar. But against the backdrop of rising religious conservatism, these meetings have led to little change on the ground. "There were honest intentions for dialogue from both sides in the past. Unfortunately, with the interference of politics and the rise of those who believe they are divinely ordained to rule Egypt, this has ended," El-Derini says. Nevertheless, some Shia activists still have hope for meaningful change. "We have faith in the Egyptian people," says El-Nafis. "We aren't afraid of extremists because if it were not for the Egyptian people and their tolerance, we would have been killed a long time ago." This is a latent lie. Egypt has never been a shia nation for even a single hour, but was ruled by shia during the Fatimi era. Being ruled by shia government in no way means that the nation has become Shiite. So Please do not mix orange with lemon in your calculation. Sunnis (salafists) are completely different from us , they insult the holy Family of The Prophet (pbuh), and you know what salafis do too? they help Israel's regime to kill muslims (who are shia), I'm talking about Al-Qaeda and Saudi Arabia. It seems that these are dangerous times for any minority residing in Egypt. Anyone of any faith who is a productive law abiding citizen should be left alone, religion is between the individual and God. The Sunni's maybe converting to Shiaa because of the social, religious and political conflicts spear headed by some Sunnis......also we are in dire need of any good politicia or leaders, and his religious sect should not even be in question! All of these problems are raising their ugly heads, as Egypt sinks into a social and economic abyss. This is not the time for any religious debates! Whats problem, if anyone chose any faith. Why Some peoples are so conservatives and aggresive? Live and let others to live peaceful! Excellent article. Why was't it translated to Arabic? Whenever I read Articles from this website, I cannot believe it is from Ahram Organisation. Are you related to the Ahram infamous newspaper? where do i have to go to convert from sunni to shia? i'm so tired of being sunni, its so...blah. If you judge your brother's Faith,you will be judged back. If you act like wild animal, harm, hurt, oppress and cruel other people, and then you will be destroyed completely one another. Gal. 5:15. should live in peace, because Islamic teaching is peace and live in harmony. If you can not live in peace, you are not Islam or Muslim. If you kill one another that is evil acts. Shia are completely different from us , they insult the holy Company of The Prophet (pbuh), and you know what shia do too? they help Assad's regime to kill protesters (who are sunni), I'm talking about Hezbollah and Iran.